WASHINGTON CITY — The Washington City Police Department is asking for the public’s help in identifying a person of interest in connection with a number of vehicle break-ins reported Saturday. Shortly after 2 p.m. Saturday, officers responded to the Washington City Community Center at 350 Community Center Drive on report of a vehicle burglary that took place in the parking lot of the facility, Washington City Police Lt. Jason Williams told St. George News Sunday. Investigators spoke to the individual who reported the first vehicle burglary, and during the course of the interview, they learned of several other vehicles that were also broken into. “We actually ended up with seven vehicles that were broken into after officers responded to the center,” Williams said. The police department is requesting the public’s help to identify the owner of the white passenger car shown in a photo captured from surveillance footage. The photo is included in this report. Anyone with information that might help police identify the vehicle’s owner or information on the string of vehicle burglaries reported Saturday is asked to call the Washington City Police Department at 435-986-1515. 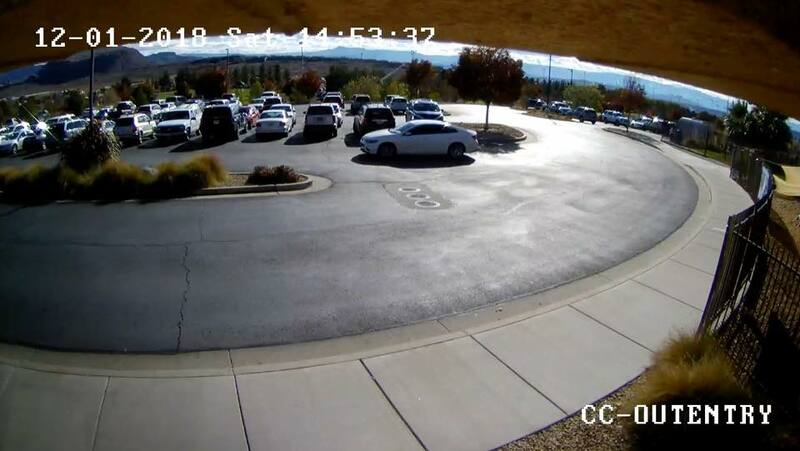 Of the more than 360 reported vehicle burglaries in Washington County in 2017, 79 were reported in Washington City, compared to 210 in St. George, according to the 2017 Crime in Utah report released by the Utah Department of Public Safety. Throughout the entire state of Utah, more than 16,600 vehicle burglaries were reported in 2017. According to a study by the National Highway Traffic Safety Administration, it is estimated that up to 50 percent of all vehicle-related theft is due to owner error — the burglaries are typically crimes of opportunity. “… Thieves see an opening and take advantage. The openings can be little things, like leaving the car unlocked, a window or sunroof down, or leaving your valuables out in plain sight,” Protect America says. Laptop – or its bag. Lock the vehicle — it is estimated that up to a quarter of all car burglaries involve an unlocked vehicle. Keep the car tidy — even an empty shopping bag or item with little or no value can could be mistaken as something valuable when seen from the outside. Remove valuables — don’t move them to the trunk or other areas of the car in public view. Park the vehicle in the garage if possible, but still lock doors and other points of entry. Don’t leave belongings in the car overnight, as a majority of car burglaries occur at night when the vehicle is parked outside of the home or when a vehicle is parked in a parking lot unattended for long periods of time. Let’s get these … . Maybe a theft ring? What’s great about Washington County, is we work together as whole. Remember, simply write down a suspicious plate #… observe. The little things are often what leads to the culprit. Wondering if the burglars actually smashed any windows to get inside these vehicles? Or were windows left rolled down and/or doors left unlocked like so many people here tend to do? Mean Momma thanks for sharing that information! This is awful and I hope they catch whoever is doing this! Wouldn’t a bait car work? Catch em and they’ll get out after paying $50 bail. KR567, you are correct, it will not stop them, but many thieves are unwilling to smash the window on a car, and would rather target cars that are already unlocked or have windows down. I always lock my car and roll my windows up no matter what. Why make yourself an easy target? I never said that. I am saying locking your car, rolling up your windows, and keeping valuables out of sight will help prevent it. No, of coarse that won’t stop everyone if they are determined enough.